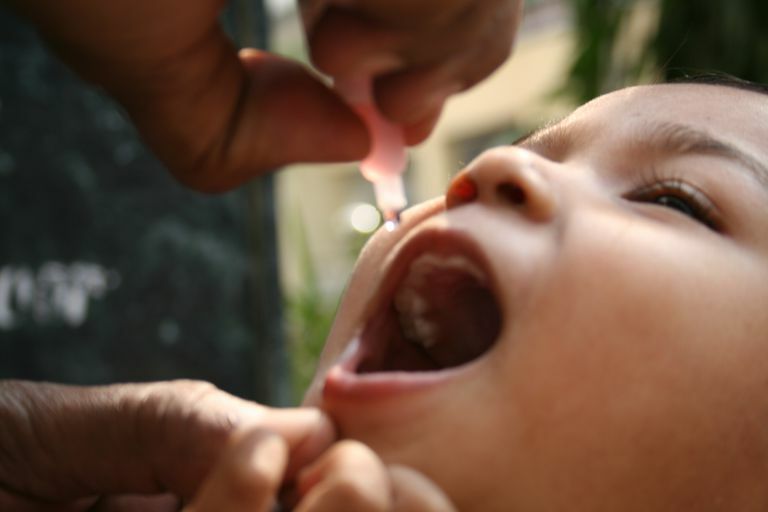 When given a vaccination, most children develop antibodies that can help them resist specific viral infections, such as hepatitis B, polio, and measles, etc., or bacterial infections, including tetanus, pertussis (whooping cough), and diphtheria, etc. Although there have always been some people who have been against vaccines, most people have thought of vaccines as one of the greatest health achievements of the 20th century. A booster dose of MMR is first recommended in 1989, but only for kids who live in counties that have at least 5 cases of measles. The routine 2 dose MMR schedule wasn't put into use for all kids until 1994. A flu shot for all healthy children between 6 and 23 months became a formal recommendation for the 2004-05 flu season. Beginning in the 2004-05 flu season, a flu shot is recommended for women who will be pregnant during flu season, in any trimester, which is different than previous recommendations for a flu vaccine if a woman was going to be beyond the first trimester of pregnancy during flu season. Unfortunately, even though they are in a high-risk category, only about only 13% of pregnant women received a flu vaccine in 2003. Havrix, another hepatitis A vaccine, is approved in 2005 and the age indication for both hepatitis A vaccines is lowered to 12 months. A combination vaccine that protects against both Haemophilus influenzae type b and Neisseria meningitidis serogroups C and Y were approved by the FDA in 2013. MenHibrix is recommended for infants at high risk for meningococcal disease. Trumenba, the first vaccine to protect against serogroup B Meningococcal disease is approved by the FDA (October 2014). Previously, Bexsero, a MenB vaccine that is approved in some other countries, was given to some college students during outbreaks under the FDA's expanded access program for investigational products. Both are now recommended by the ACIP for those at increased risk for meningococcal serogroup B infections. Gardasil 9 is approved by the FDA (December 2014) to provide protection against five additional types of HPV. Although they don't change the number of vaccines your kids get, combination vaccines can reduce the number of shots he gets at each visit. For example, instead of three separate DTaP, IPV, and Hib shots at his two, four, and six month well child visits, your child could get single Pentacel shot each time. The current form of the childhood immunization schedule, which is put out each year by the Advisory Committee on Immunization Practices (ACIP), the American Academy of Pediatrics (AAP), and the American Academy of Family Physicians (AAFP), was first published in 1995. At that time, recommended vaccines included hepatitis B, DTP, although DTaP was available for the booster doses at 15 to 18 months and 4 to 6 years, Td, OPV (oral poliovirus vaccine), and MMR. And since vaccines were introduced for these and the other vaccine-preventable infections, cases for most have decreased 99 to 100 percent. As more and more is done to reassure parents about the safety of vaccines, including that the efforts to link autism and vaccines have been disproved and thimerosal has been removed from all vaccines in the childhood immunization schedule, it would be unfortunate to let vaccination levels drop and these diseases return. Long: Principles and Practice of Pediatric Infectious Diseases Revised Reprint, 3rd ed. - 2009. American Academy of Pediatrics Committee Report: American Pediatrics: Milestones at the Millennium. Pediatrics, Jun 2001; 107: 1482 - 1491. Shapiro-Shapin CG. Pearl Kendrick, Grace Eldering, and the pertussis vaccine. Emerg Infect Dis. Volume 16, Number 8-August 2010. Poliomyelitis Prevention in the United States. Updated Recommendations of the Advisory Committee on Immunization Practices (ACIP). MMWR. May 19, 2000 / 49(RR05);1-22. Evan J. Anderson. Impact of Rotavirus Vaccination on Hospital-Acquired Rotavirus Gastroenteritis in Children. Pediatrics 2011; 127: e264-e270.